Top Fuel Motorcycle legend Larry “Spiderman” McBride was rained-out of his final two exhibition passes at this past weekend’s Night Under Fire from Norwalk, Ohio. Before the event was called, McBride gave the thousands of motorcycle and drag racing enthusiasts in attendance some quality entertainment with an impressive 6.01 at 222 mph. After crossing the finish line, McBride did something he has never done before. He pushed a button on his handlebar to deploy a parachute. 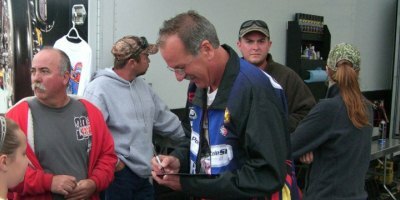 After a heaving rain forced the cancellation of the remainder of the event, the 10-time champ spent the rest of the evening signing autographs.